Alberta Urban Municipalities Association (AUMA) President Mayor Lisa Holmes offers her thanks to outgoing President Helen Rice at the AUMA Conference in Calgary Friday. Holmes officially took office during the final day of the conference and will hold the position for two years. 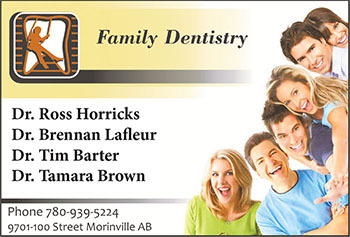 She is the third Morinville mayor to hold the office. Both Mayors Art Soetaert and Lloyd Bertschi served in the position. Motivational speaker Alvin Law was at the Morinville Community Cultural Centre Sept. 23 to speak to Morinville Public School Grade 1-8 students. Law is a Hall-of-Fame keynote speaker and Attitude Expert who uses his story of being born without arms to challenge and inspire. Musicians Mary Kieftenbeld and Stephanie Renaud sing to Primeau Grade 5 students during the Criss Cross Ministries Welcome Rally held Sept. 23. The event focused on a message of empowerment, which compliments the character development in the school’s PRIDE program. PRIDE is an acronym for the behaviours the school wants to recognize and celebrate in school: Prepared, Respect yourself and others, get Involved, make good Decisions, and achieve Excellence. The Morinville News participated in Alberta Culture Days over the weekend by taking the community to the movies for FREE. Saturday’s showing of Jurassic World, a month before it is available on DVD, drew close to 200 residents and their children for a Saturday night outing. 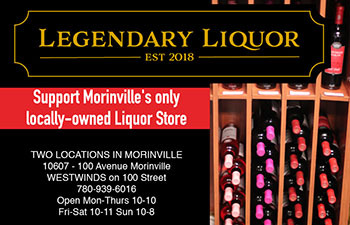 The Friends of the Morinville Public Library were given the opportunity to run the concession, with 100 per cent of proceeds going toward library programing. Based on the success of Saturday’s event, The Morinville News will be looking to do more FREE community movie nights, turning the concession opportunity over to local non-profits. Chris Schmidt glues the button eyes on his black crafty bat at the Alberta Health Services Day Program held at Morinville Clinic Sept. 23. Rita Hebert was dishing up breakfast at the Rendez-Vous Centre Sunday morning with George Tellier in the background in charge of the steam line. The Knights of Columbus breakfast, back after a summer break, is held on the last Sunday of the month and runs from 9 a.m. to 12:30 p.m.
Rona Ambrose, Conservative Party of Canada candidate for Sturgeon River-Parkland, took part in the ribbon cutting at Prairie Gardens on Saturday. Ambrose also had a chance to blast off the famous Pumpkin Canon during her visit. The event was attended by the region’s mayors, including Morinville Mayor Lisa Holmes. Residents from Sturgeon County and Morinville were given an opportunity to drop off useable items they no longer want or need and take time to browse through and take items dropped off by others free of charge. The initiative is aimed at keeping useable items out of the landfill. This fall’s event was a single-day event with extended hours instead of the two-day run event earlier this year. Top: Linda Lyons browses the selection of books. Above: Tara Humen looks at some stuffed toys up for grabs at the event.